We Ship Nation-Wide! FREE Shipping on all items. At Ready2Go Office Furniture, we strongly believe in doing business from a place of integrity. We do this by focusing on constant communication, on-time delivery, and exceptional service. In short, we focus on handling all of the details so you can focus on your business and trust that it will all be completed beyond your expectation. This is the difference you get by working with a professional installation and delivery company. What can I expect from the installation and delivery process? Each project we take on is approached with a three-step process. What is the scope and needs of the project? What are your specific expectations? After all is said and done, are you more than satisfied with our service? By doing this, we ensure that your products will be delivered on time, accurately installed, and tested for proper functionality. Where can I have my furniture delivered? We will deliver your products directly to your office, workspace, or facility. Or we can even ship them to a warehouse. From there, our installation team will transport them to your requested location. Expert Office Furniture Installation and Delivery Services. 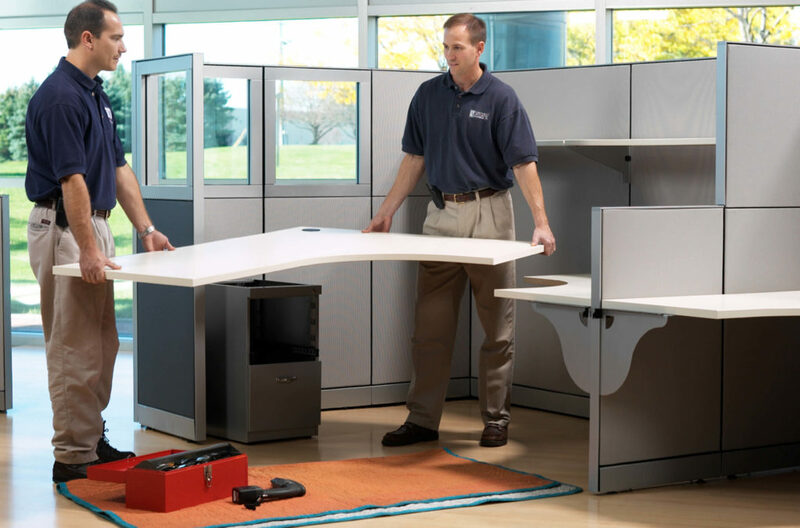 When it comes to installing new office systems or relocating existing office furniture, our highly trained and experienced installation team is ready to assist you. Our customers can be assured that their corporate furniture is installed in a manner that will ensure functionality and longevity. Give us a call at (317) 694-7197 or head into our showroom located at 6830 Industry Place #C, Indianapolis, IN 46219 to learn more about our installation, furniture assembly, and delivery services.